The overall market tends to slow and vacations take precedence typically during the summer months. However, this year the metals could spur strength. The Long Beach Coin Expo was predictably slower than normal for most dealers. The main thrust of activity seemed to be for bullion related material. Whether it was modern Gold, Platinum, and Silver coins or generic U.S. Gold prior to the 1930’s, most visitors were looking for more than just collector coins. They wanted something that could appreciate along with the price of metals. 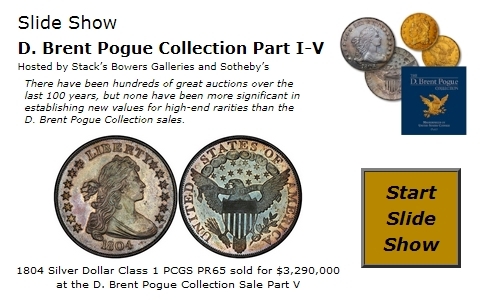 Not all collectors require the comfort of bullion based coins. There are still many looking for nice coins to add to their collections. In this market, inventories need to be turned fast in order to make profits so dealers are looking to sell coins quickly. And collectors are taking advantage, searching out bargains, looking for coins that have low populations for the grade. Highest grade for the date is still a popular request, especially for coins in the 1800’s. There are minor downward adjustments in this week’s LD Wholesale Market Dealer Price Guide after many declines over the last two to three months. Although high value coins are still selling, some of them may require discounts of previous levels in order to attract today’s buyers. One series that always attracts collectors is Standing Liberty Quarters. This is still the case today, however, it appears that collectors are searching for coins that are a little nicer than average for the grade. We are finding various discounts for the more common issues. It would appear that sellers are offering these coins to their best customers but the ones that do not sell become quick sales to discounted buyers. Nevertheless, coins that are fully struck, have great eye appeal, or have very few distractions are likely to trade at or near current FMV. If these characteristics are combined with the rare dates, then buyers will still line up with their competitive buy prices.